I love love this quilt. It will so perfect slung over the back of my couch for the summer. I fixed that Oops block…and despite many of you telling me to “leave it”….it would have made me a crazy lady so I fixed it. I’m weird like that. I pieced the back…the two large pieces are from The Good Life Collection from Robert Kaufman hitting stores in June & the navy blue strip is the Denyse Schmidt collection at Joann’s. I quilted swirls & loops on this one…it turned out really really good. 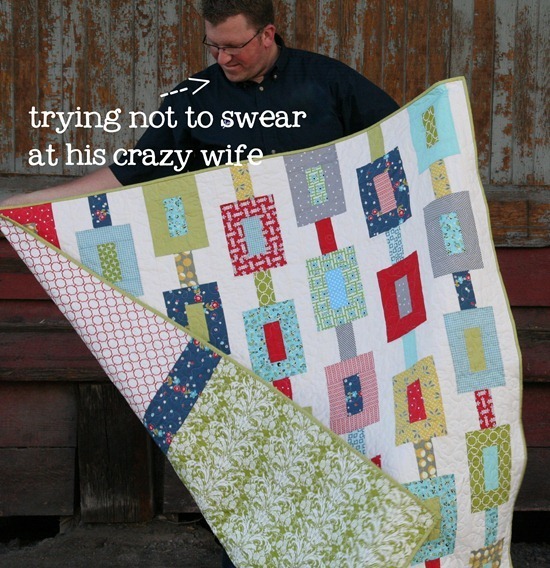 I have to say a big ol’ thank you to my husband for standing out in public holding up quilts while the wind is blowing and his wife is barking orders….love you lots Jay. Wouldn’t ya know that the day after Market I got the flu? I’m counting my blessings I got it after market and not during. Puking & patterns just don’t mix. Love that second last photo – it looks like the quilt is just floating in mid-air! It is a gorgeous quilt!!! Good work. Beautiful quilt. I hope you are feeling better. Such a great quilt! Feel better soon! I had the flu this week too -ick! Very pretty! I'm trying to work on something kinda similar right now, but running into problems. you are right! puking and patterns… not a good combo! i am working feverishly on my kaleidoscope and loving every minute of it! i will post an update on my blog soon! hope you feel better quick so you can keep making cute cute cute quilts! So pretty! I hope you feel better soon. You are a trooper! The quilt looks fabulous! I love these colors!!! And the back looks amazing. Glad you were able to fix the "oops block", if it were mine I would have done the same thing. So sorry to hear you aren't well :( Hope you feel better soon! This is beautiful! Love the colors and the pattern is wonderful. Hope you feel better soon! those quilts are all the buzz right now~great job! I really like the colors you chose for that pattern. Looks great! The quilt is really wonderful! I love the modern look to it. The quilt looks fabulous! Happy for you that the plague at least held off until after Market, hopefully it is over soon. You looked so cute in the random pictures I have seen from others at quilt market. your quilt is so beautiful, front and back! Hope you feel better! Love it! Love the colors too. Hope you're feeling better. Love the quilt. 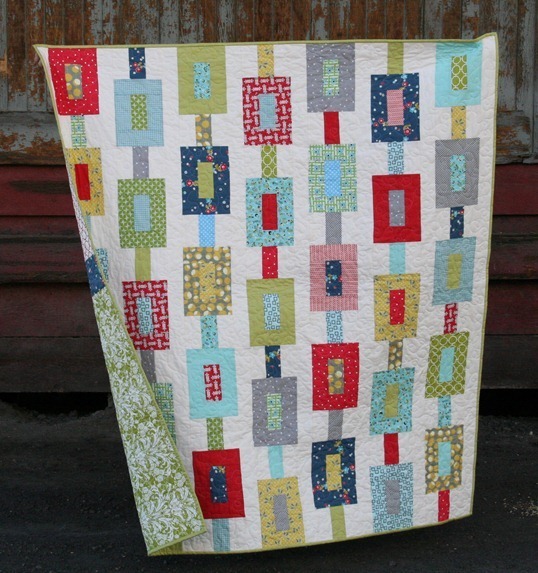 don't puke on that quilt – it is too gorgeous! Really love that quilt! Think it is my favorite one so far! I love this quilt and the colors…it is really beautiful! Hope you feel better soon. 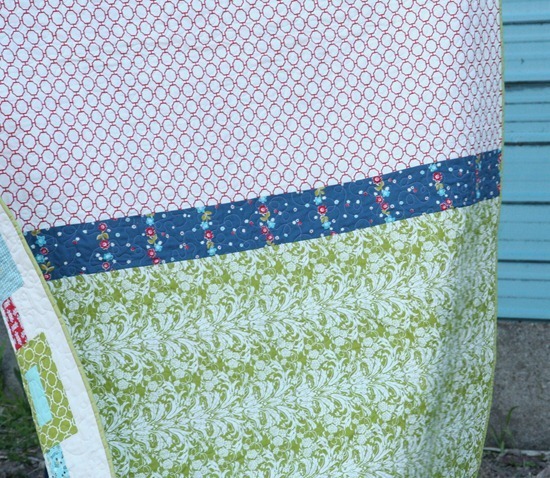 I love, love, love this quilt too! And it was so nice to meet you at market. I'll be making this soon, by the way…love it! In all seriousness — I hope you're feeling better! The quilt looks fab. The husband looks patient. Saw you at market and loved your stuff!! Didn't know until Sunday when my VT, Ceri, came that you were a relative of hers. Now I will check your blog out every chance I get! Awesome! I love that last photo too! You are too funny! Get to feeling better soon! 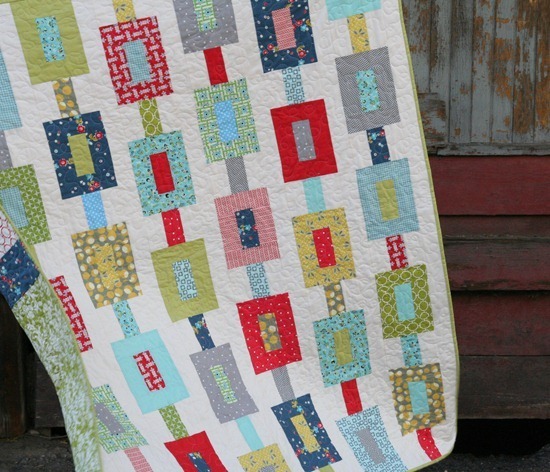 This quilt is totally "on track" for me–it's great! Yay for not getting sick until after market. BOO for having to puke. I can hardly think of anything worse. Except for maybe an unexpected run-in with a snake. Because I'm phobic like that. I love the quilt! Love the choice of fabrics too :) and I'm so sorry you're ill, I went through 3 months of minimal food last year as my tummy wouldn't hold anything. Anyway, what I mean to say is that sometimes puking isn't optional. But it's not the normal state of things, so bodies tend to get over it as soon as possible. I hope you feel better really soon, and can't wait to see what you make next! Ooh, sorry about the puking. Hopefully it wasn't food poisoning from some sketchy quilt-party you went to over the weekend . . .or maybe too much 80's music. Oh dear, you got it afterall. Our kids share everything with us, don't they? The quilt looks wonderful, though. It was lovely to meet you. Oh, so pretty. I love the fabric and the pattern. I love your quilts! I made the road trip quilt! I was wondering if you quilt for other people i am looking for someone to quilt two quilts i have the tops done. I bought this one and another new one of yours from FQS. You didn't have any for sale. Love your quilts. So sorry about the flu … it can happen with the adrenaline letdown after a major event, particularly a First Market (lovely booth!). You'll be an old hand at the next one … hopefully Fall Market will not be as stroll-in-the-park-slow. it was SO NICE to meet you at Market!!! i hope you had a great one! this came out so good- I love it!! hope you feel better! too funny! i love it when quilters include their hubbies in their pix of quilts!! and how icky that you got the flu when you got back but as you say, at least it was after. Indulgent Husbands are the best!!!! Your quilts always make me smile. And that to me is one of the best things to find in a quilt! What color thread did you use to do the quilting? It blends in nicely (from what I can tell in the pictures). I finished the a king size top using this pattern and will be doing it on a long arm this weekend. I am down to figure out thread color to quilt with and I can't decide. I used the Kate Spain "Honey Honey" line from Moda and it turned out great. I also added 2 borders, a 2 1/2 inch and a 5 inch. Thanks!